Ship, Store and Distribute Materials Safely, Securely And Economically-Used By Lading Companies, Ideal For You. Safe, Secure, and Sustainable. The improved all plastic attached lid container leads the industry in design and proven performance. Taken out was the traditional metal hinge –replacing it with a safer and more durable all plastic hinge. This series of plastic shipping containers is the choice of much of the distribution industry. 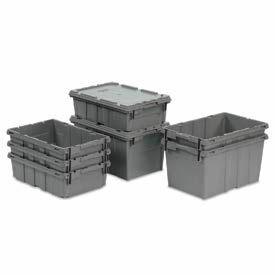 Manufactured from high grade-high density polyethylene plastic, the enhanced storage container is made to ship, store, and distribute goods and products in the toughest of environments. The all new plastic hinge design means there is no metal in the hinge of the container –making this container the safest and most sustainable in the market. Raised lip edges allow secure stacking. The attached lid container saves money too while allowing empty containers to nest inside each other when not in use. Molded grip handles have an integral hasp to accept cable ties for security. The Best Value plastic storage container offers increased safety and durability –all at a great value. 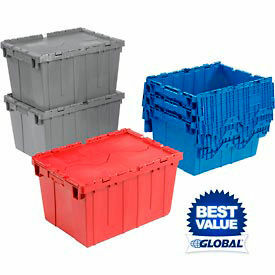 These plastic containers are available in Gray, Blue and Red. Add the optional Dolly Bases for easy transport of your plastic containers. 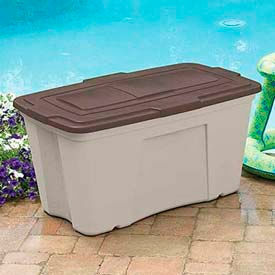 Click here to see our full selection of Shipping & Storage Containers. 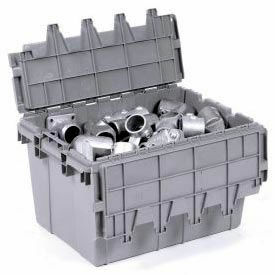 Buckhorn Distribution Containers Feature Hinged Lids to Secure Contents During Shipping, Picking and Storage Use. Heavy-duty, returnable and reusable attached lid containers are made of versatile high-density polyethylene. These shipping containers are used for applications in retail, wholesale distribution, grocery and general manufacturing. Plastic containers have flip-up lids that interlock for stacking strength and nest when lids are open. Solid bottom. Individual load capacities are 40, 60, 80, and 100 lbs. Stacked load capacities are 300, 320, 400, and 500 lbs. Carton quantities are 3 and 6. Available in Gray and Green. Dimensions vary per model. The Shipping and Conveyor Totes Feature 180 Degree Nest And Stacking To Save Space. USDA and FDA compliant. These shipping totes are made with injection molded, high density Polypropylene that withstands temperatures from -10°F to 250°F. Cross stack and nest totes comply with USDA and FDA regulations for use in food processing applications. 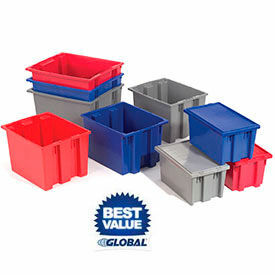 These plastic shipping totes wont crack or corrode and are waterproof to ensure long life. 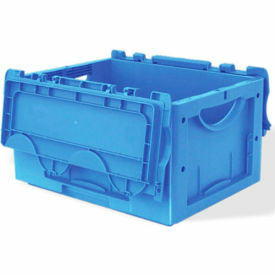 Pallet totes feature 180 degree nest and stacking to save valuable storage space. Shipping totes fit on standard 48" x 40" pallets and have a textured bottom to ensure a non-slip grip during transport and in transit on conveyors. Optional Lid protects contents and accepts security tie closure for added security. Shipping totes are sold in carton quantities. Akro-Mils Nest And Stack Shipping Storage Containers Are Designed For Storing, Assembly, Picking And Conveyor Processing In Commercial And Industrial Applications. Storage containers are made of durable high-density polypropylene that is injection molded for uniform wall thickness and long lasting strength. FDA compliant food storage containers withstand -10° to 150°F. Quick 180° turn offers space-saving stacking and nesting. Fits 48" x 40" pallets. Optional lids snap tight for a safe and secure fit. Available capacities per box are 45, 55, 60, 65, 70, 75, 85, 90, and 100 lbs. Stacked capacities are 225, 275, 300, 325, 350, 375, 425, 450, and 500 lbs. Colors are Blue, Gray, Red and Clear. Dimensions and package quantities vary per model. 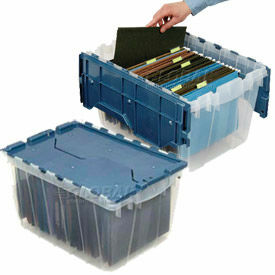 Akro Mils See-thru KeepBox Storage Containers are designed for quick content identification. 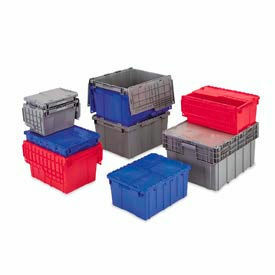 These high density polypropylene distribution containers have reinforced ribs and padlockable hinged lids that interlock for extra strength. The stainless steel hinge pins protect contents. The attached lid containers nest when open to save space. Molded handgrips allow easy lifting. Sold in carton quantities. 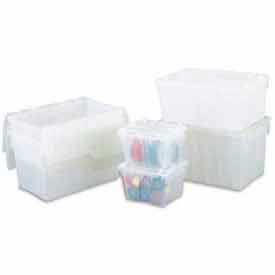 Akro Mils Plastic Distribution Containers with Attached Lids Securely Snap Closed to Protect Contents. High density polypropylene shipping containers have reinforced ribs and a padlockable lid with stainless steel hinge pins for extra security. These attached lid containers nest when open and feature handgrips for easy mobility. Sold in carton quantities. Add the optional Steel Dolly to easily transport your shipping containers. Transparent Shipping Bins Provide Optimal Viewing Of Contents. 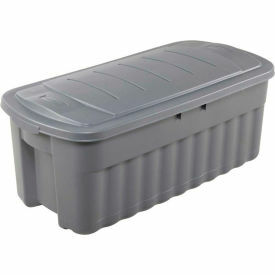 These impact resistant clear polypropylene storage containers are designed to last and provide instant visual inventory. Great for use in distribution applications such as health and beauty aids, pharmaceuticals, grocery and general merchandise. Containers stack up to 5 units high on a 45 x 48 pallet. Interlocking, structurally reinforced lids are hinged for easy, secure closure. These attached lid containers nest when open and feature handgrips for easy portability. Recessed cover within the perimeter protects against cover breakage during transport. Quick-release label areas for easy identification and fast label change. FDA approved. Orbis Flipak® Attached Lid Distribution Containers Are Designed For Optimal Safety And Security When Shipping Or Distributing. Orbis Flipak® Attached Lid Distribution Containers are made of high-density polyethylene plastic for long lasting durability. Features an attached lid for added security during storage and shipping. Flipak® attached lids are interlocking with reinforced hinges for added safety. Bins are made with a nesting design for easy storage and portability. Molded-in handles offer better grip when handling for ease of use. Raised-lip edges allow secure stacking when closed. Attached lid containers includes integral hasps to accept cable ties or padlocks for enhanced security. 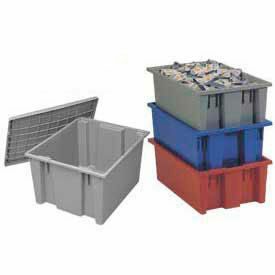 Bins, totes and containers are reusable for greater versatility. Easy to clean. Rust-resistant. Colors are Black, Blue, Gray or Red. Dimensions vary per model. Package quantities are 1, 3 or 6. Nestable Containers Meet The Diverse Needs Of Various Picking And Shipping Environments. Safely and securely distribute materials with these durable, affordable shipping containers. Made using injection-molded high density polyethylene. Reusable totes can be used for over 250 trips. Used for health care, wholesale, pharmaceuticals, soft goods, grocery and more. Smooth, drafted walls allow easy handling. Molded-in grip handles have an integral hasp to accept cable ties or padlocks for security. Containers are nestable when empty for compact storage and reduced return shipping costs. Gray color. Optional Lids (sold separately) allow secure stacking with raised lip edges. Sold in carton quantities of 5. SSI-Schaefer Attached Lid Containers Are Used For Lean Manufacturing And Conveyor Systems. SSI-Schaefer Attached Lid Containers are made of polypropylene to provide long lasting durability. Attached lid features works well with most conveyor systems. Stackable for easy storage and access to contents. Reinforced base, reinforced top rim and integral hand holds provide additional structural integrity. Lid has locking latches for security. Cubic foot capacities are ,4, .7, .8, 1.5 and 2.2. Color finish is Blue. Dimensions vary per model. 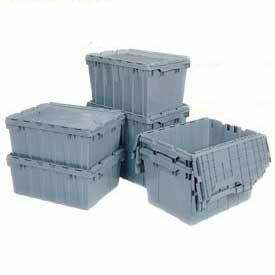 The jumbo boxes provide extra roomy for bulky items, such as large holiday decorations or large garden tools and more. You can trust the Roughneck Storage box to stand tough in harsh hot or cold temperatures that can be found in basements and attics. The container is made from a tough polyethylene plastic with a secure stay tight lid. Stay organized with a Suncast 2 ft. 11.5 in. x 3 ft. 3.5 in. x 1 ft. 8.5 in. Outdoor Bin. Stay-dry design in great for tools, toys and cushions. Built-in wheels and handles allow for easy movement of storage bin. the 50 gallon interior keeps seat cushions, grill accessories, toys and outdoor gear safe and organized. Price each sold qty of 3.